This cartoon refers to defense cuts proposed by the Obama Administration (and possibly more specifically, to the proposed reduction of deployed strategic nuclear weapons--see Thursday's Daily News Article). 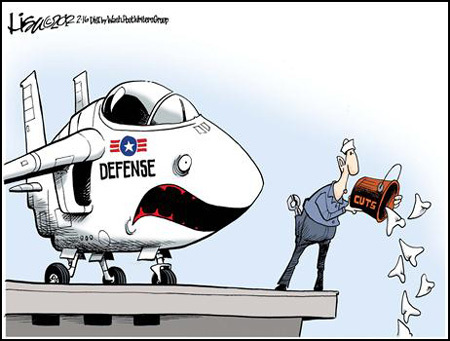 The cartoonist implies that the cuts will "remove the teeth" from U.S. defense. 1. In reference to this cartoon, what would the expression "it has no teeth" mean? 2. Do you think the cartoonist's depiction is accurate? Explain your answer.